This section is in honour of those who'd otherwise type tl;dr.
Based in Hack and Slash. A roguelike isn't primarily about plot development or telling a story. It is about killing things and acquiring treasure. Random games. A roguelike is a dungeon crawler where no two games are the same. The maps are different, the items are different, there are no guaranteed win paths. Permadeath. You die, that is it. No restoring a savegame. Good roguelikes delete your save game after loading them. This is compensated by the replayability of the game. Steam rolling monsters. If a critter is in your way, and weak, you shouldn't even notice it is there. For more information about roguelikes there is the Rogue Basin, a Wiki documenting this genre, and the Temple of the Roguelike, a newsite tracking developments in the field. Having defined Roguelike, POWDER is easy to describe: A Roguelike designed for the Gameboy Advance and Nintendo DS. Descend into the depths of the dungeon until you reach the foul daemon known as "He who the author cannot spell consistently", or, Baezl'bub. When you have slain Baezl'bub in heroic combat, or, if Baezl'bub dies in any way, retrieve his black heart and bring it to the surface world. You may then go the nearest newsgroup such as rec.games.roguelike.misc, and post YAAP (Yet Another Ascension Post). Note: Some POWDER files are packed with .tar.gz. Linux users can use tar -xzvf filename.tar.gz to unpack. Windows users can use 7-Zip to unpack. The released files are merely the .gba rom. To play it, you can use an emulator. I personally use VisualBoyAdvance for debugging. I do not recommend this for playing the game, however, as if you have a real PC you should really take advantage of the full keyboard. Flash solutions have advanced a lot since I first released POWDER. Modern solutions use normal flash cards to transfer the file - you can just copy powder123.gba to your flash card and it is ready to play. Unfortunately, being homebrew, you can't "patch" POWDER with any of your card's special saving abilities. This might make it difficult to save games as they need to be written from the local SRAM onto the flash card. With a Supercard Mini SD I had luck with the "Quick Power Cycle" method, but I have seen cartridges for which this doesn't work. Two files are present, a .ds.gba and a .nds. Depending on your solution, you only need one of them. If in doubt, use the .nds file. POWDER supports DLDI so you can, if needed, patch it to support saving. During start up it prints out if it found a FAT filesystem - if it found one saving should work. If it doesn't find one, saved games will not survive a power cycle. All auxillary files are saved and read from /DATA/POWDER, regardless of where POWDER itself is copied onto your flash drive. That directory will be created if it doesn't exist. If it fails to create, it will default to using the current directory of POWDER. The released .zip contains a simple executable. Run it. You may need to grant execute permissions to the .dll's provided. Drag and drop the POWDER program from inside the .dmg into the location in which you want to play it. .TXT and .SAV files will be created in that location, so you might consider making a subdirectory rather than running on your desktop. It should then Double Click and run. Versions after 100 require OSX 10.4 or above, but should support both PPC and Intel Macs. The released .tar.gz contains a simple executable. Run it. You may then discover that you need to install the most excellent SDL library. You may also discover that your variant of Linux won't work for some arcane C runtime library reason. Let me know the version of Linux and the error, and I may be able to do something. Versions after and including 097 are built on Debian Stable, and after and including 100 with statically linked libraries. I created POWDER for one simple reason: I wanted a roguelike on my GBA. The standard RPGs were annoying me with endless battle screens against weak enemies to unfold a drug induced plotline. I wanted a game I could just jump into, and start killing things. Having had more hours than I'd care to log playing Nethack, ADOM, and the Diablos, I knew the exact type of game I wanted. The problem was I didn't see anyone publishing it any time soon. POWDER has grown from these humble beginnings. Years of polish have resulted in a game which can stand on its own without needing to rest on its uniqueness in the handheld space. This is fortunate as Nethack can now be played effectively on the Nintendo DS. POWDER was developed with HAMlib. The DS version of POWDER uses devkitPro. POWDER isn't the only roguelike on the GBA now. Donnie Russell has successfully ported the original Rogue - the game from which the term roguelike is derived - to the GBA. His ClassicRogue can be found at http://www.freewebs.com/drussell/ClassicRogue.htm and his GBA port thereof at: http://www.freewebs.com/drussell/Download.htm. On the DS the competition between roguelikes is fast and furious. Not only do you have POWDER, which now fully supports the stylus, but thanks to the power of the DS various PC roguelikes have been ported. 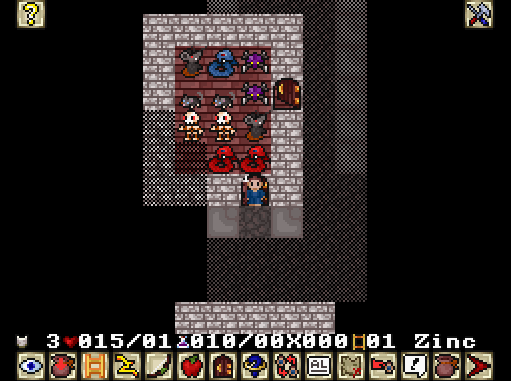 NetHackDS brings the full power of Nethack to the DS. DSCrawl also exists if you can track down a version. Sadly, the last version I know of didn't support DLDI so you likely won't be able to save, a rather crippling deficiency in a game world the size of Crawl. All product names are the trademarks of their respective owners. All material is reserved by Ytinasin, and any copying should be performed after appropriate permissions is received. Beware of squirrels travelling after midnight.